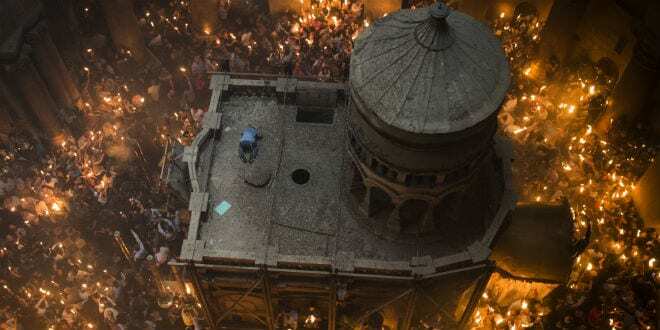 The Church of the Holy Sepulchre, one of the holiest sites for Christians in the Old City of Jerusalem, reopened on Wednesday after a three-day strike led by the Greek Orthodox Patriarchate who claimed they were responding to anti-Christian measures by the Israeli government. This could not be further from the truth. The Israel Land Fund is an organization that acquires land in Israel for Jews. King has served as a Jerusalem councilman for several years and is very familiar with land sales in the Old City. The controversy came to a head last month when the Jerusalem Municipality announced its plan to collect NIS 650 million ($186 million) in property taxes on 887 church-owned properties that were not being used as houses of worship. The municipality said it had refrained from such tax collections as per a long-standing agreement between Israel and the church pertaining to church properties. After considering the legality of the tax agreement, the municipality concluded that this agreement did not apply to church properties not used for religious purposes, and two weeks ago, Jerusalem moved forward with the process of collecting taxes from the Anglican, Armenian church, Catholic and Greek Orthodox church. The Greek Orthodox Church petitioned to be exempt from these taxes as well as additional taxes resulting from payments relating to a 2016 sale of 125 acres in central Jerusalem. A bill was also introduced by Kulanu Member of Knesset (MK) Rachel Azariain that would allow Israel to confiscate land that was sold by the churches to private developers in cases where homes had been built on the lands. Azaria said that bill seeks to protect hundreds of Israelis, primarily those in Jerusalem, whose homes are located on land that until recently, was owned and leased to them by the churches and particularly by the Greek Orthodox Church. The contracts signed between the church and the purchasers state that ownership of any buildings on the land will revert back to the church when the leases run out. Residents expected for the leases to be extended but in recent years, the Greek Orthodox Church has sold large amounts of real estate to private investors as way of erasing massive debts. Due to the Greek Orthodox Church’s press to sell properties, people who signed these long-term leases are now concerned that when the lease expires, the church will not renew the leases or do so under much worse conditions. On Sunday, the Greek Orthodox Patriarchate released a statement that was signed by the Catholic and Armenian churches, which together comprise the triumvirate responsible for the Church of the Holy Sepulchre, declaring that Jerusalem’s move to collect taxes was an anti-Christian act of revenge by the Israeli government. “The systematic campaign of abuse against Churches and Christians reaches now its peak as a discriminatory and racist bill that targets solely the properties of the Christian Community in the Holy Land is being promoted,” the statement read. The dispute, however, has been temporarily averted. Jerusalem Mayor Nir Barkat issued a statement on his Facebook page Tuesday night, in which he announced that after consultations with Prime Minister Benjamin Netanyahu, tax collections would be suspended until the formation of a committee to negotiate with the churches. On Sunday, the debate on the bill introduced by Azariain was suspended. Israel’s Hadashot News said that Netanyahu had decided to intervene in the controversy after Israel came under heavy pressure from the Vatican, Orthodox countries like Russia and Greece, and from Evangelical Christian groups who are staunch supporters of Israel. The church leaders responded to Netanyahu’s decision to suspend the tax collection process by opening the doors to the Church of the Holy Sepulchre on Wednesday morning. “After the constructive intervention of the prime minister, the churches look forward to engage with Minister Hanegbi, and with all those who love Jerusalem, to ensure that Our Holy City, where our Christian presence continues to face challenges, remains a place where the three Monotheistic faiths may live and thrive together,” the church leaders said in a statement. The seeds of the current dispute were planted several years ago when the Greek Orthodox Church, the second largest landowner in Israel after the Israel Lands Authority, began selling properties to anonymous private investors. The sales were conducted below the radar since many Jewish buyers used front companies to purchase the properties. When the sales were discovered in 2005, Greek Orthodox Patriarch Irenaios I was dismissed. Since much of the land sold by the Church was in Jerusalem, areas the Palestinian Authority (PA) intends to be part of its capital, the PA launched an official investigation. Other properties were in areas of Jerusalem that were part of Israel before 1967. Under PA law, selling land in Israel to Jews is a capital offense. Irenaios’ successor, Patriarch Theophilos III, attempted to annul several of these sales in Israeli courts. A lower court ruled all of the sales by the church were proper and legally binding. The Greek Orthodox Church has already appealed the case to the Israeli Supreme Court. Theophilos also led the strike, which closed the Church of the Holy Sepulchre. The situation became even more volatile last summer when it was discovered that Theophilos personally approved additional land deals. 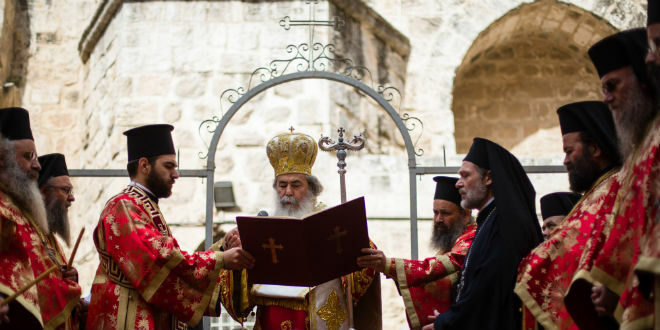 Palestinian Christians in Israel and Jordan are now calling for Theophilos to be dismissed, and earlier this month, the Arab Central Orthodox Council called to dismiss Theophilos. The controversy surrounding the Church of the Holy Sepulchre appears to also have a strong political angle regarding the Israeli-Palestinian conflict. Patriarch Theophilos III is a major critic of Israel’s policies regarding the Palestinians, and he initiated the Kairos Palestine Document supporting armed resistance to the “Israeli occupation” and demanding the removal of security checkpoints and the security barrier.